Create an instant wow factor by renting these versatile buckles that can be used to gather corners, as a napkin ring, or to embellish the sash on any chair cover. 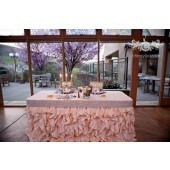 Talk about a great way to personalize your sashes and napkins! SUBCATEGORY: CHARGERS – Add a sophisticated statement to your table with these beaded edged gold or silver chargers. A perfect addition to any china.